Want a Brand New Toyota OEM Battery? We are proud to offer BRAND NEW OEM TOYOTA Hybrid Batteries for the Generation 2 (2004 – 2009) Toyota Prius for $2295 including FREE mobile installation in Houston, Dallas, Austin, San Antonio, Texas! Round trip shipping on your new or refurbished Prius battery is $195 FREE FOR A LIMITED TIME (Contiguous US only). Returning your core to us is as simple as placing the prepaid shipping label on the crate and calling FedEx to schedule a pickup. Core return required. Free Mobile Installation In Houston, Austin, and Dallas, Texas. Our technicians will replace your battery at your location in about one hour! Mobile installation is also available in other parts of Texas and in Louisiana for an additional travel fee. Not close to us? No problem, we can ship! Shipping for Generation 2 Prius Batteries is free! Yes, both ways! Battery Failure or Something Else? Not sure if your hybrid battery has failed? We can help. Look through our FAQs for a fast answer. Let us know the details of your battery needs! We specialize in replacing your failed hybrid battery pack at a reasonable cost. Whether you choose a new or rebuilt battery, you can count on our mobile installation service to deliver the best product at a great price. 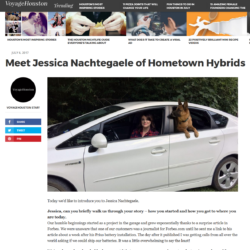 My friend sent me a link to an article, which featured a small company called Hometown Hybrids, which had lower prices than most other hybrid battery places. I set up an appointment and they came out to ME on my own time and was going to install it in my apartment garage, but after the installer, Matthew, ran a few tests, he said that my hybrid battery was actually working fine. He told me he didn’t want to waste my money and that if I didn’t need a replacement, he didn’t want to install it. (Most shops and auto-repair companies would have taken my money without any further questions!) He also seemed to know my Prius inside and out, and explained to me the battery processes. While my case wasn’t like most, because I didn’t have the battery installed, I am extremely impressed with the company’s honesty and integrity, and I highly recommend Hometown Hybrids for any issues that might come up with your pesky hybrids. So incredibly happy to have found this amazing family run business. They are truly a gem and have outstanding business practices. They showed up at my house exactly on time! A house call is such a thing of the past that more businesses should consider following the lead of these guys. It felt so good to recycle a battery at such a reasonable price and therefore not harm the earth or fill the landfill as others would do. My Prius was bought used and while I drove it 50,000 miles in the past 3 years, I always questioned the battery because it did funny stuff. My car now runs better than it ever has and it came with a much better warranty than I would have gotten for even brand new at the dealer. Highly recommend these guys and will tell everyone I know with a Prius in this state of Texas to use them for sure. Thank you so much for doing what you do!! Jessica and Matthew deserved 10 stars. They were professional, on-time and way, way under budget. Not to mention just plain nice. Matthew, the hybrid repairman, met me at the dealership. I paid Toyota my diagnostic fee and drove the car down the road to a parking lot. About 50 minutes later Matthew had my old hybrid battery swapped out for a freshly rebuilt one. The lights on the dashboard went off. And my faithful Prius was up and running. Matthew let me hang around as he completed the work, showing me the basics of the repair. I watched his every move, and he didn’t misplace a bolt or forget a washer. My 2006 Prius was back and better than ever. Well, I am one very pleased customer and will sing your praises to every Prius owner I know (several) and meet in the future. Matthew was wonderful-prompt, courteous, personable and competent. This was the best car repair experience I’ve ever had. What a great guy! I feel good about keeping my 2006 longer and knowing that the old battery will be recycled. Awesome service! Everyone I spoke with was very knowledgeable and helpful. The mobile service came right to my house, I didn’t have to go anywhere. They gave me options before doing any work, so I was able to make an informed decision. The price was very reasonable, a lot less expensive than the dealer. I would definitely recommend this service. Thank You!!! I cannot really explain how much stress was taken off my shoulders by having a working car again and not being forced to settle on a new-to-us car…keeping things on our terms is truly appreciated!